If you've read this blog a lot, you already know that inexpensive but good firearms are of great interest to me. I am an engineer, and I like technical challenges. Building a quality gun by throwing money at it is a solved problem. The question is, can a decent gun be built inexpensively? 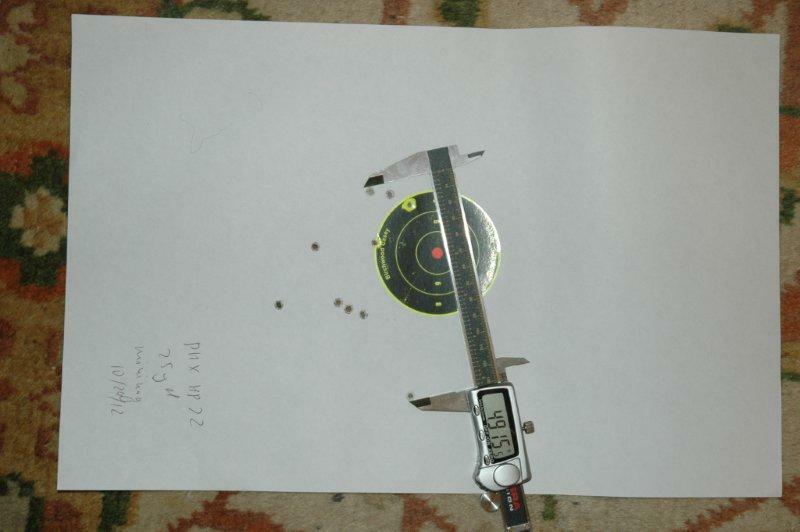 This is the reason I like Savage guns so much - their price/performance is unbeatable. This is also the reason I like 22s, because their total cost of ownership is extremely low. 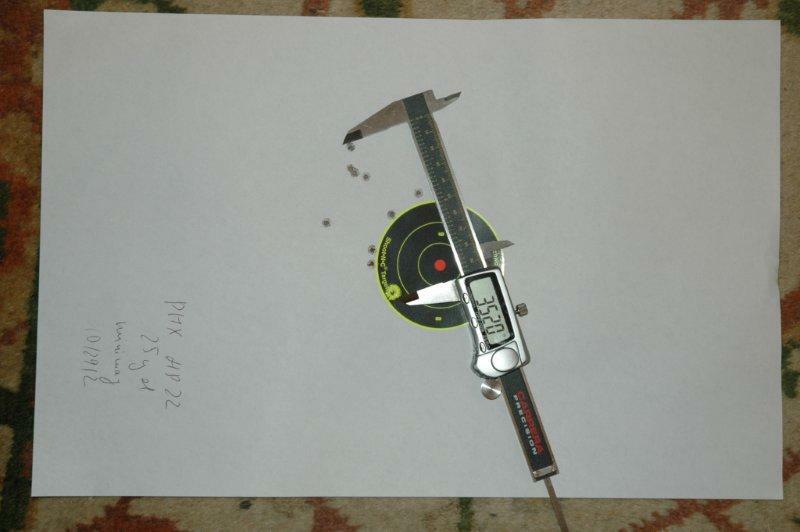 And this is why, when I see a super cheap currently produced pistol, I usually buy it. "For science". 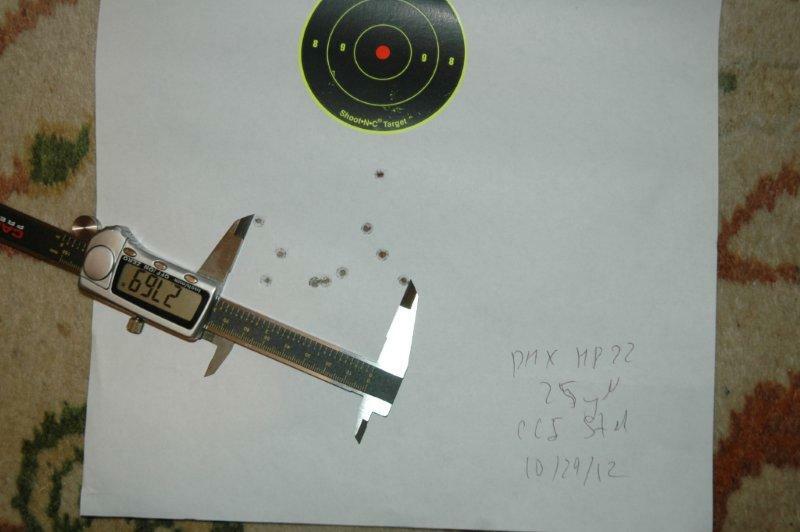 Phoenix Arms HP22 was one such purchase. 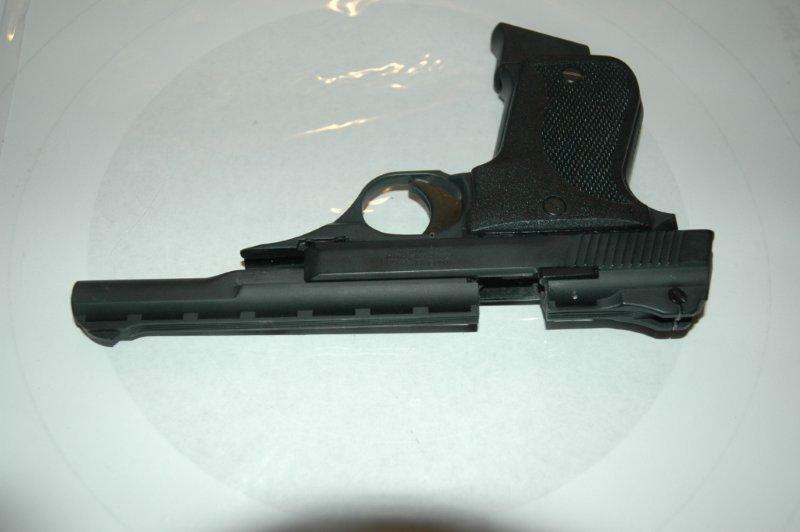 In its basic configuration the pistol sells for $125 on gunbroker, and the wholesale price is lower. I bought a more - although not much more - expensive "Rangemaster" version with 5" barrel. 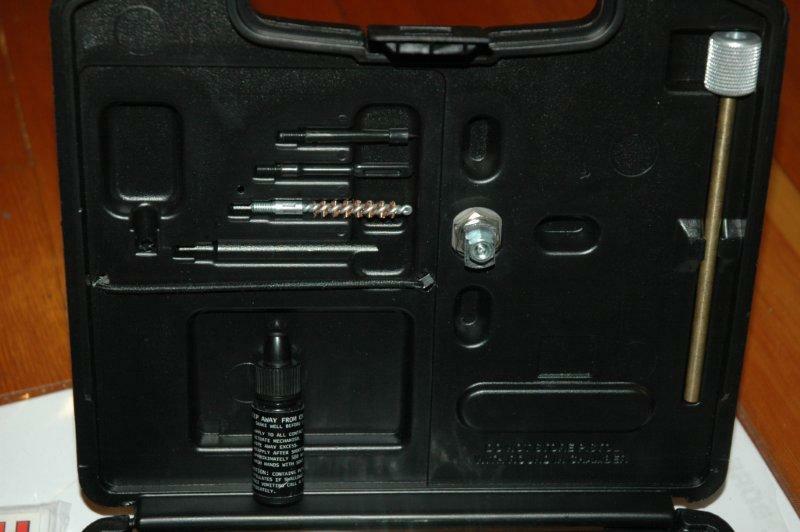 Despite its very low cost, the pistol is an all-in-one solution: it comes with everything that you need: locking plastic box for storage, the cleaning kit including patches and oil, and a pair of ear plugs. 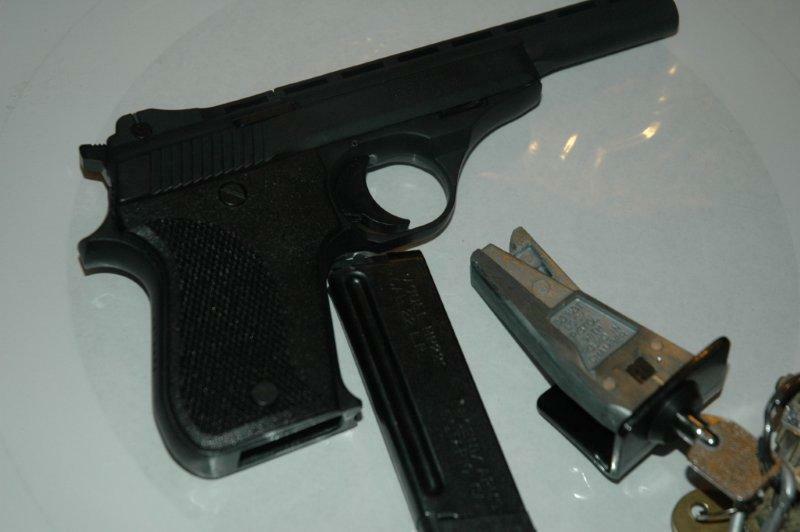 The pistol itself resembles a "Saturday Night Special". Perhaps having this in mind, the manufacturers added an overwhelming amount of safety features, making it at times fairly hard to use. You've already seen the locking box. 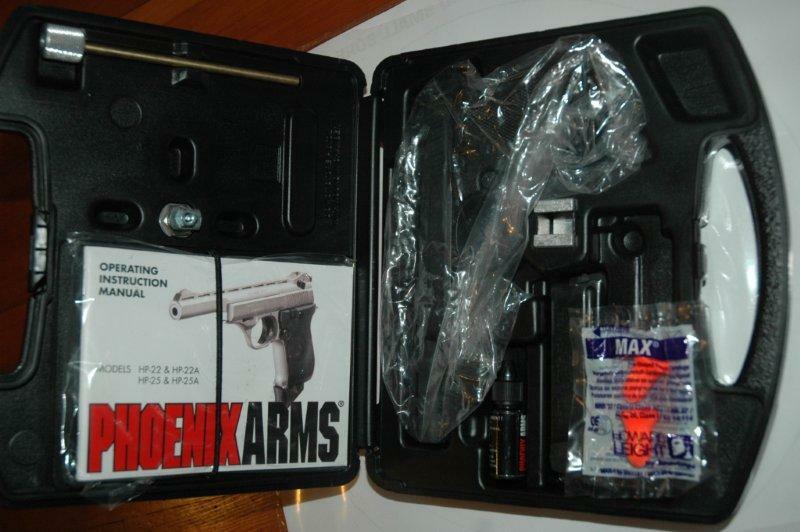 Inside the box the pistol must be stored with a locking magazine insert (the key is the same as for the box). 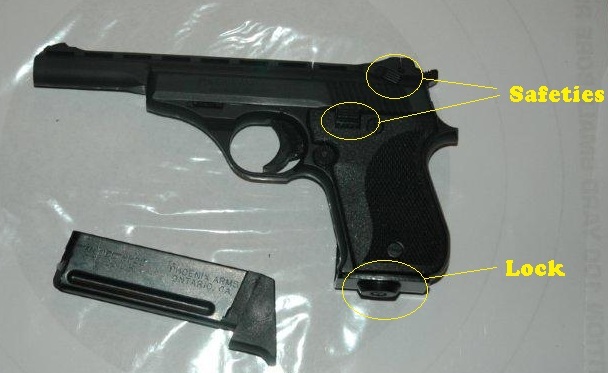 You cannot store the pistol with the magazine inserted - it does not fit. In addition to the magazine lock, there are TWO safeties, not one. The sense of beauty is strictly individual, so you be the judge for yourself. Disassembly is easy, and the instructions are clear and easy to follow. You pull the lever above the trigger guard forward (this lever is called the "barrel lock") and winch the barrel upwards. And then everything just falls apart. 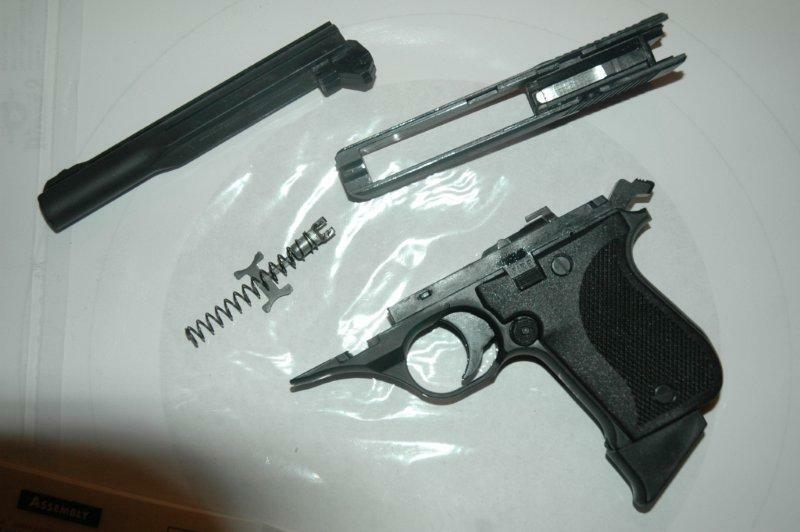 To assemble, you need to first insert the barrel lock back (the flat part goes inside the flat rectangular hole in the frame), then you can place the slider on top of the frame, insert the spring, and, holding the lock back, winch the barrel into the pistol. Because of so many safeties, the operation can be confusing. 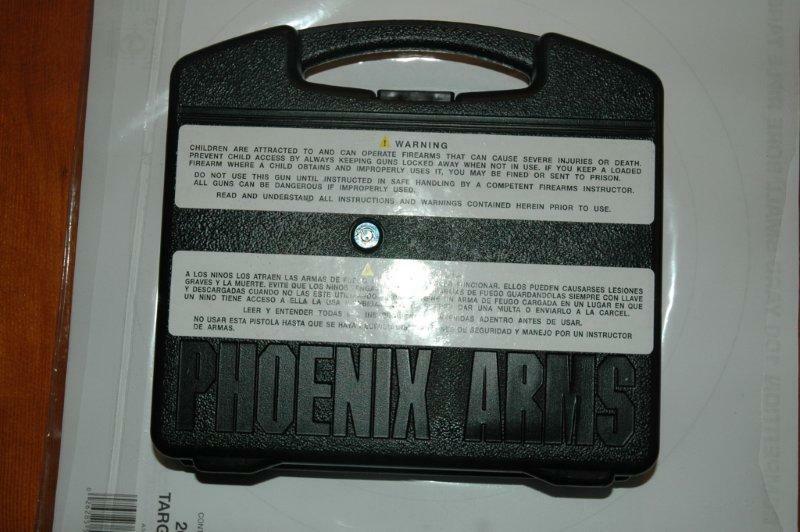 The magazine can only be inserted or removed if the magazine safety is in the safe position. The trigger can only be operated if the magazine safety is in the fire position. 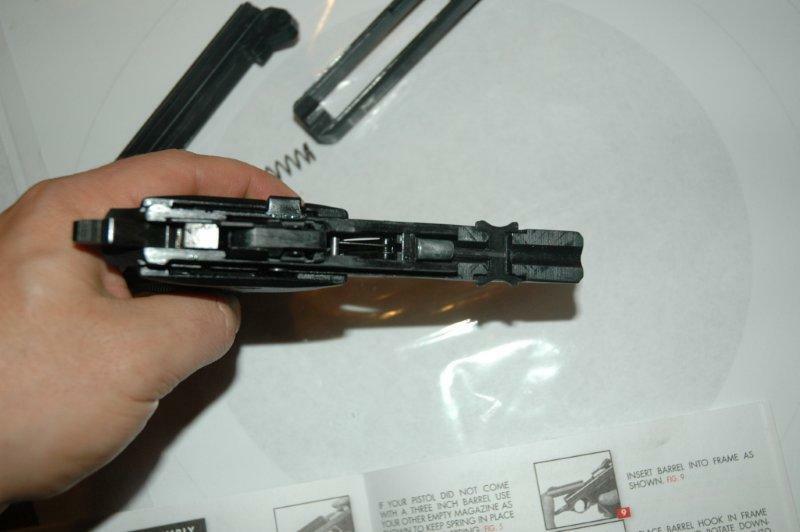 The safety on the slide blocks the firing pin only, and has no effect on anything else. The pistol is single action only. 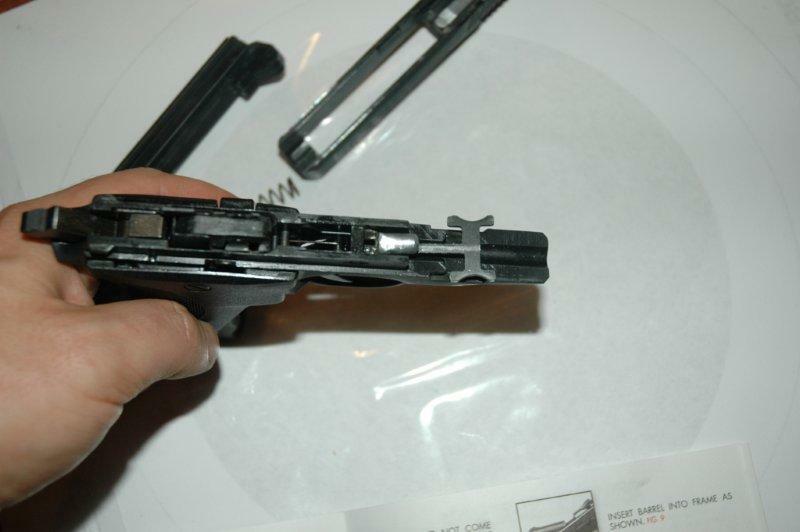 It does not have bolt hold open, so there is no obvious way to see whether the magazine is finished. There is a chamber flag, but it is not visible from the firing position. The magazine has a pretty sturdy spring, and no way to compress it other than pushing the rounds down into it, which makes fully loading it a bit challenging. The trigger is not bad. 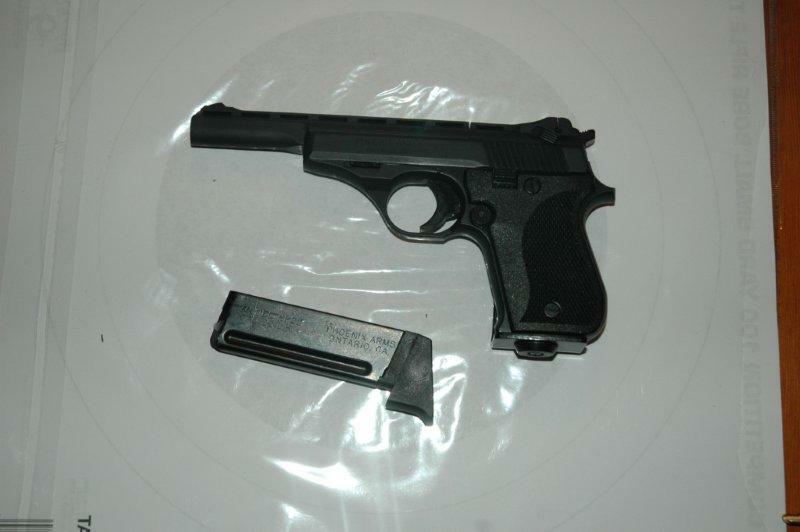 It's on the heavier side for a single action pistol - 6.5lb, but it breaks cleanly, no grit at all. 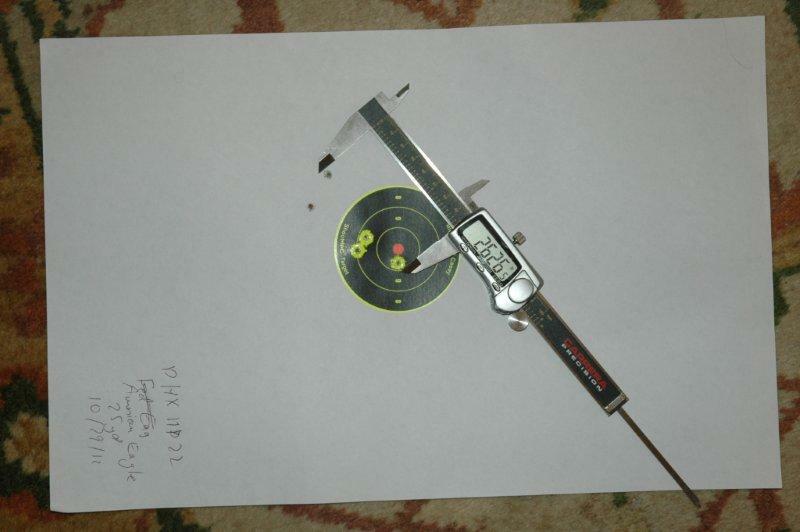 In fact, the trigger is not that dissimilar from Ruger 22/45. 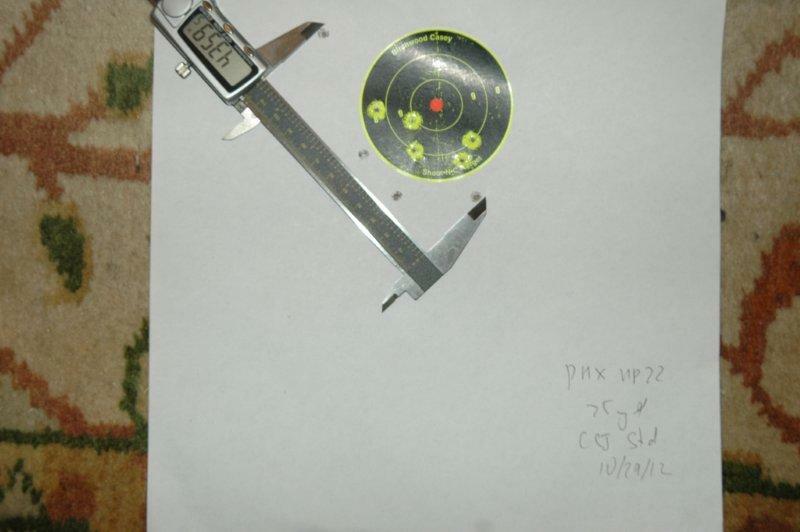 Rear sights are adjustable for windage only. 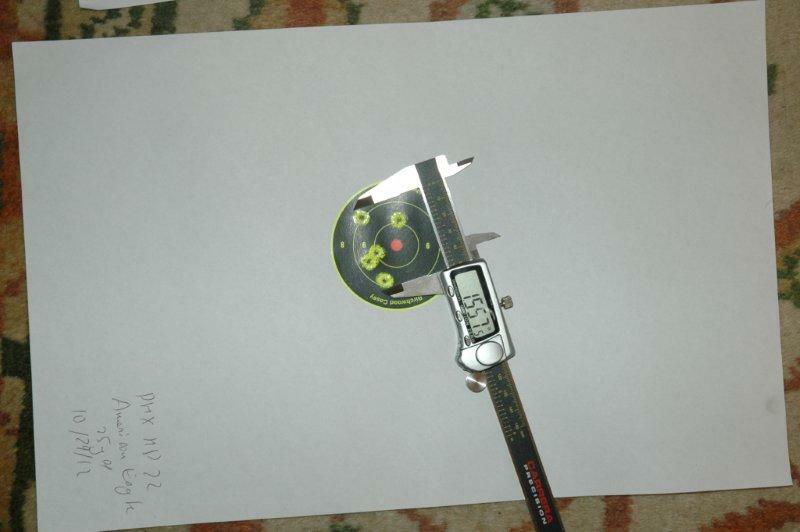 The front sight is notched and you are supposed to make corrections based on the notches. Those of course are not that easy to see, so I don't think this strategy works. 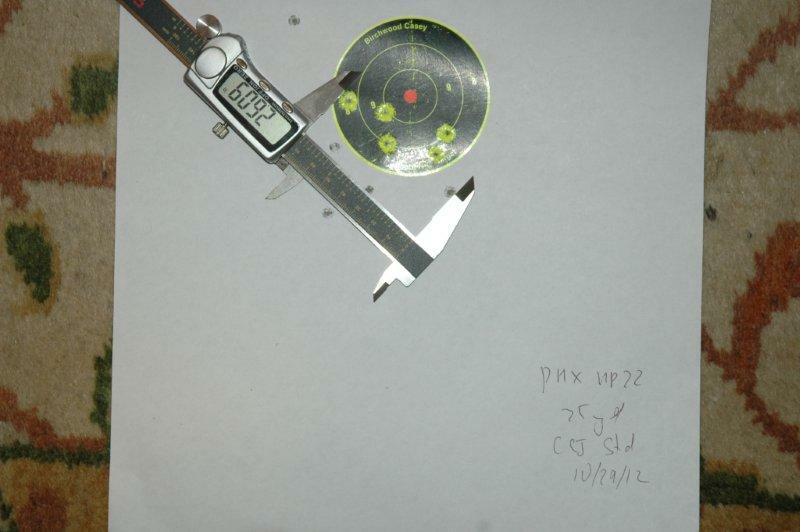 The following targets were all shot from the bags using iron sights. 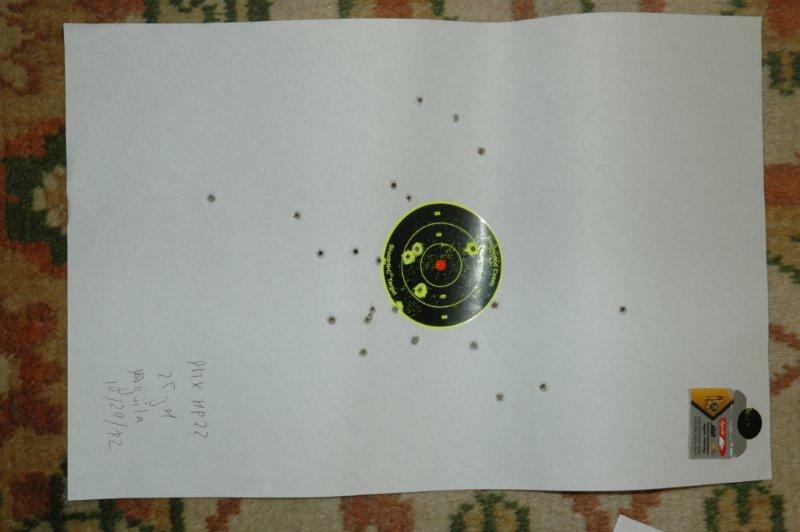 The sights on the pistol are not amazingly good, so shooting with it accurately was a challenge. 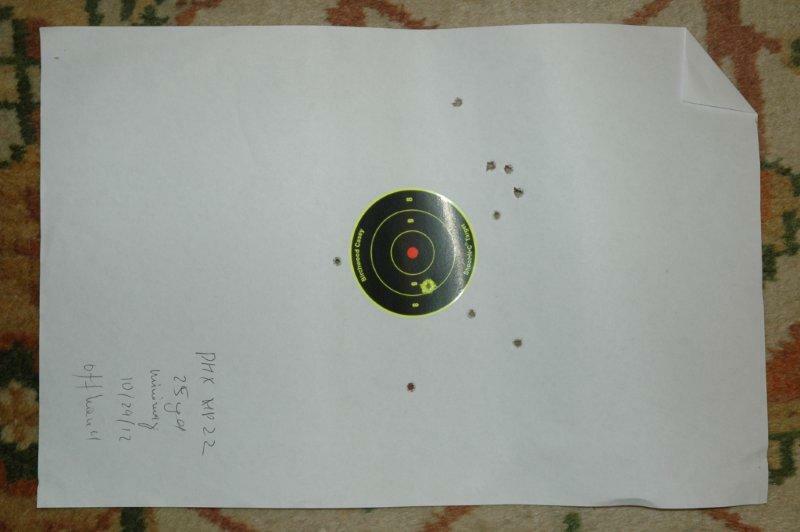 The sights would be the one thing in the pistol that I would have changed: having wider, better visible sights, ideally with adjustable elevation. If Hi-Point can do it with their $100 pistols, certainly it can be done here. I've shot quite a few 10-shot groups with it. 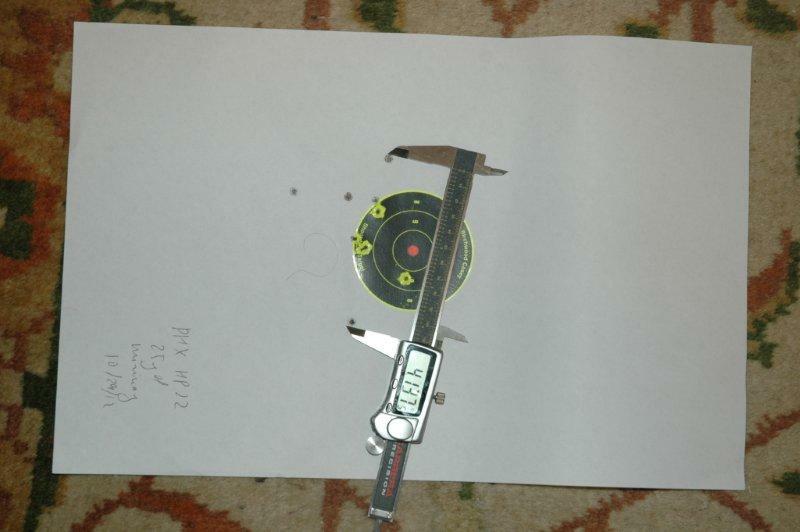 There were two kinds of groups: ones packed in under 3", and ones where 9 shots would be around 2.5" with one flier that would open the group considerably, to 4" or more. The distribution between these two types was roughly 50:50. Minimag produced groups from 5 down to 3.5". The group size shrunk progressively as I was shooting more of it. Remember, superfast hypervelocity does not equal accuracy! Considering the cost, the pistol is not bad at all! 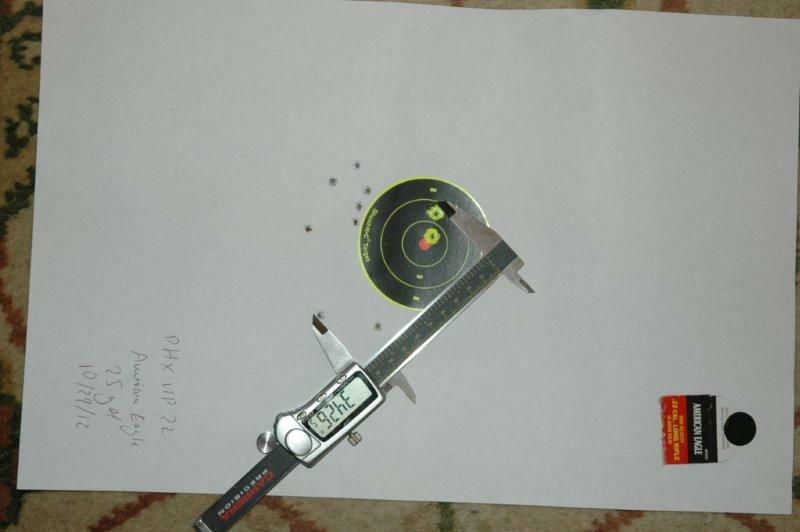 Its a bit clumsy to operate because of proliferation of safe features, but once you manage to load it, shooting it is a pleasure, it's light and fits my hand well, and the accuracy is acceptable. I am keeping mine, and I would definitely recommend this pistol to anyone who is looking for an inexpensive plinking pistol.